I have some British, American and Australian readers of my blog. I am hoping that I will also get some interest from Spanish readers. With this in mind, I thought that I would write a post in Spanish for them. Really, this challenge started in Spain at the beginning of the year. My first beer of the year was in a small village outside of Jaen, El Carpio. On our way back from Jerez with Conchi’s family, we stopped for New Year’s Day lunch where I had a typical Spanish beer, Amstel! Later on in the day we met up with Conchis friends at Panaciete for beers and tapas. Here I had my second beer, Cruzcampo. Cruzcampo is an andalucian beer that was made for the first time in Seville in 1904 but now it is also made in Jaen and other cities. I do like Cruzcampo and I think it is one of my favourite Spanish lagers. At Christmas in Jaen, I had Cruzcampo de navidad. This one was even nicer, being stronger and slightly darker. The next day (2nd January), we had to travel back to the UK via Madrid. We had lunch in Madrid, close to the Atocha train station, at a place called El Brillante, a place that is famous for their bocadillos de calamares (deep fried squid ring baguettes that are a Madrid specialty). 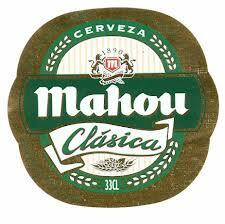 Lunch was accompanied by a glass of the local beer, Mahou Clasica, or as I like to pronounce it Ma-who! I quite like Mahou too. But I suppose that you can’t go too wrong with a nice cold glass of lager. The next three beers that I drank back in the UK were also Spanish beers, San Miguel, San Miguel 1516 and Ambar Tres Maltas. So the first six beers of the challenge were all Spanish. It was a very Spanish start to the 365 beer challenge! I will get an opportunity to sample more Spanish beers soon. Our next trip to Spain is in March for 9 days. Unfortunately, I know that my beer choices will be limited in Jaen. That’s not to say that I don’t like Spanish beer, as you can see from above, I do. But the choices of beer in the bars are nowhere near as extensive as your English establishment. The bars in and around Jaen are normally Cruzcampo only places. When I will be drinking at Conchi’s parent’s house, I know that I will be able to try Alcazar and Alhambra. 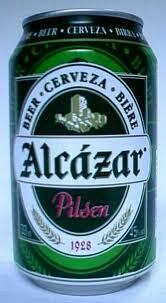 Alcazar is a beer that is made in Jaen but was bought by Cruzcampo sometime ago. The distinctive green cans have a picture of Jaen castle. 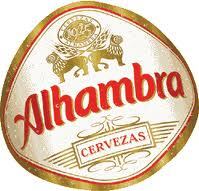 Alhambra is the local beer from Granada. So I have a challenge to put to the Spanish people that I know, friends and family of me and Conchi. Can you find some good, new beers for me to try? It can be any kind of beer, as long as I have not tried it before. Bonus points available if you find a Spanish ale. Good luck. This entry was posted in Uncategorized and tagged Alcázar, Alhambra, Ambar, Amstel, Beer, Cruzcampo, España, Jaén, Mahou, San Miguel. Check out http://www.cervezorama.es. It’s a super nice store in Calle Malasaña, in Madrid. They have not only a ton of craft beer from all around the world, but also a lot of very nice Spanish craft beer: I recommend Yria, which is made by the store people, ZZ+ or something like that (you’ll see it easily because it has a ZZ top like guy in the label, and La Virgen rubia. Stay away from Cibeles, they’re trying to put beer out faster than they can brew it and when I tried it it was more like a malt juice with raw yeast… yuck!! Also, you can go to La Tape, three blocks away in Malasaña and San Bernardo, where you can find 6-8 craft beers on draft, one of them usually La Virgen Rubia, which is made close to Madrid. You can also visit the small brew pub they have in the brewery (check http://www.cervezaslavirgen.com for more info). Enjoy your trip and the new and great Spanish craft beer movement. Cheers! !